Since launching Homeschoolers Anonymous last year, we have called for — and organizationally been working towards — a number of actions from within homeschooling communities. One of the actions we have been most outspoken about the need for is public awareness campaigns about recognizing and addressing child abuse. This is what we asked HSLDA to do when we created our #HSLDAMustAct campaign — and it’s something we aim to do through our non-profit organization Homeschool Alumni Reaching Out. It would seem, therefore, that I would be ecstatic about the fact that Frontline Family Ministries (FFM) — a Christian organization led by homeschooling parents Lisa and Doug Cherry — recently announced their “National Sexual Abuse Prevention Week for Homeschoolers.” Not only is this a week intended to bring awareness to sexual abuse and prevention strategies, some of the speakers are people for whom I have immense respect. For example, Boz Tchividjian and Dr. Diane Langberg — both from Godly Response to Abuse in the Christian Environment (G.R.A.C.E.) — are featured speakers. Tchividjian and Langberg are doing vital and powerful work within Christian communities and organizations on behalf of abuse victims and survivors. I am grateful for their relentless efforts. In spite of all these facts, however, I cannot personally support FFM’s prevention week. This decision has taken months to come by. I still to this day feel internally distressed by it. 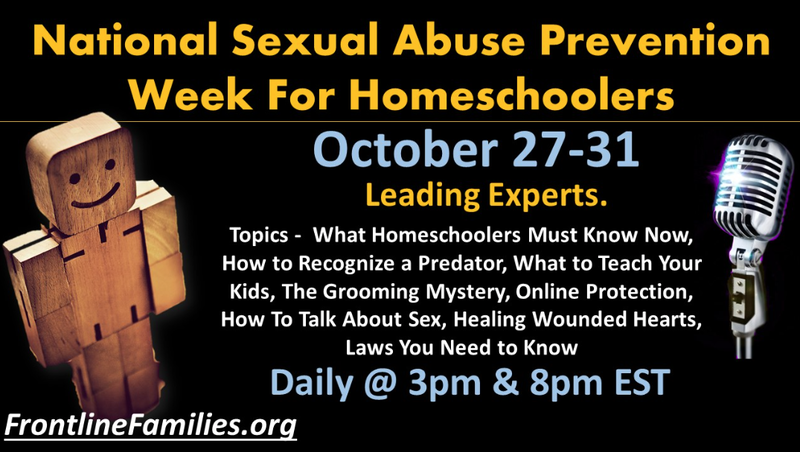 Feeling I need to oppose the first-ever “National Sexual Abuse Prevention Week for Homeschoolers” seems to fly in the face of everything I — and HARO — have worked towards. So that alone should tell you this decision was not made lightly. I first became aware of FFM and the Cherry family when Lisa Cherry wrote her “Open Letter to My Fellow Homeschool Parents” several months ago. This letter — and FFM’s resources — were highly and repeatedly recommended by ThatMom’s Karen Campbell as well as promoted by HEDUA. While I had some reservations about Lisa’s open letter at the time (some of which were well-articulated by Libby Anne), and while numerous people shared the open letter with me and asked me my opinion, I chose to be silent for the time being. (My silence was unfortunately bothersome to some people.) My one comment was along the lines of, “Something doesn’t feel right, but I can’t put my finger on it.” I did appreciate Lisa speaking up and I wanted to give her and her ministry the benefit of the doubt. I also did not want to speak prematurely or ignorantly. So for the last few months I have poured over the Cherry family’s ministry website, including all of its manifestations from the last few years via the Wayback machine. I bought and read 3 of their ministry’s books: Kalyn’s Secret by Lisa and Kalyn Cherry (2009), Not Open by Lisa and Lucas Cherry (2013), and Unmask the Predators by Lisa and (now) Kalyn Cherry Waller (2012). While this might seem excessive, I really wanted to support what FFM was doing but I could not shake the nagging feeling that something was off. So I needed to go the extra mile to be sure that, if I was to express a lack of support, that I did so accurately, fairly, and compassionately. To support Frontline Family Ministries is counter-productive and damaging to not only the homeschooling community in general but survivors of abuse specifically. To explain why, I am going to take you through 4 sets of material: the 3 books I mentioned and then FFM’s website material. I’ll make each set its own post (or sometimes several) each day this week. At the end of the week I’ll also provide some concluding remarks. The problem is the same as the with any group or stance that emphasizes “self policing”. What they mean is not letting questionable families or individuals into their groups or churches. They simply do not understand that once a family leaves the homeschooling community(however you define that), that family Is Still Covered By Homeschooling Laws! No one is going to “police” a family that showed up to the homeschooling group 3 times in 4 months and is really just a little odd, frankly….but they are still homeschoolers by law, and subject to no more or less regulation than the rest of the Real True Homeschoolers. They are all about policing the homeschool community but refuse to acknowledge the homeschoolers outside off the community. Shaming a child to teach modesty is like pulling back ona rubber band. It only will propell the self destructive behavior shooting a long way in a bad direction.